Product Description: This photographic encyclopedia of the legendary Chrysler 300 muscle cars contains hundreds of photos, graphics, TV Commercials, videos and much more. The tour starts with the first 300 optioned C car of 1955 continuing through the last of the 'letter car' breed in 1965 and then introduces the re-birth of the 'M' series in 1999 followed by the sensational 2004 rear-wheel drive V-8 300 C. Browse the statistics, the options, those tremendous horsepower engines, the emblems, the scripts, etc. It's all here! Everything you want to know about every year. It comes with the Chrysler 300 Anthology Screen Saver and can even print a book! 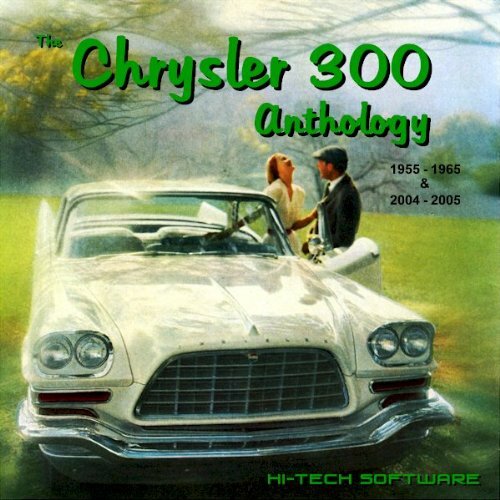 A must have for any Chrysler 300 owner or enthusiast! All photos have been recently reprocessed at a larger, high resolution of 1200x730 pixels. HI-Tech Software titles are for Windows Xp,Vista,7,8 and later.